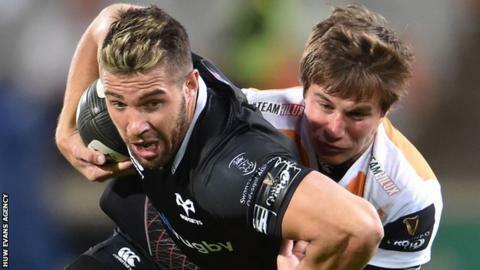 Wales scrum-half Rhys Webb can continue playing for his country after switching to Toulon, his new club have said. Webb will leave Ospreys at the end of the season after agreeing a three year deal to play in the Top 14. It was thought the move could affect his Wales future because of a selection policy surrounding exiled players. That WRU policy permits only four players at clubs outside Wales to play for the national side for the next two seasons. The quota will drop to just two wildcard picks for the 2019-20 season. "A fair deal has been found in good faith with regard to its national selection in the interest of both parties," Toulon's statement explained. Webb, 28, said leaving Ospreys will be a "huge wrench". Webb's future Wales prospects were not addressed earlier this week in a statement issued jointly by the WRU and Ospreys to confirm Webb's departure. The player's Wales and Ospreys half-back partner Dan Biggar will join English side Northampton next season. "I will continue to give the region everything I can to make sure we have the best season possible," added Webb. The news of another star's departure is a blow to Welsh rugby, with Webb to end his 11-year association with the region. He made his debut for Ospreys in 2007 after coming through the Bridgend ranks and played his first game for Wales in the 2012 Six Nations against Italy as a replacement. Webb, won two British and Irish Lions caps on the 2017 tour to New Zealand, has 28 Wales caps and scored a try off the bench for the Lions in the first Test defeat against New Zealand in June. Toulon have previously recruited Wales players Leigh Halfpenny, Gethin Jenkins, Gavin Henson and Jamie Robinson.